Machado de Assis is the preeminent Brazilian writer, a legend in his native land and arguably the most iconic writer the country has ever produced (don't say Paulo Coelho...). Which makes it remarkably surprising that I, a noted Brasilophile, have never read his most famous work. 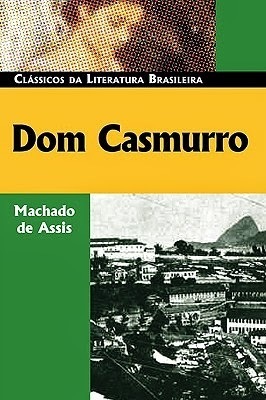 Dom Casmurro is a surprisingly complex tale (surprising because it starts off looking like a standard romance, but turns into something else altogether halfway through) that almost every literate Brazilian (apparently) reads at some point. It is a wonderfully crafted novel that is reminiscent of some great works throughout history, but still finds its own ways to captivate and even surprise readers. This is the tale of and narrated by Bentinho (the eponymous Dom Casmurro, which roughly translates to 'Lord Pigheaded' - I relied on Google Translate rather than my own rusty Portuguese skills - though I have seen it more appropriately described as 'Lord Taciturn'). Let's be clear about this from the very start - Bentinho is THE narrator, and that plays a key role in how the tale plays out from his perspective. The narrative is in the style of old Bentinho's flashbacks to his youth, and is well crafted to reflect that these are his memories rather than what necessarily happened. Bentinho and Capitú eventually have a son named Ezekiel, a ray of sunshine in their already happy lives. Or so it seems at first... Eventually Bentinho notices that Ezekiel looks less like him and more like his best friend. And other signs also point in disturbing directions. Seemingly betrayed by the love of his life and his best friend, Bentinho takes a turn for the worse and starts seeing patterns that threaten to ruin his life... It is at this point that it becomes clear to the reader that this is not a Hollywood rom-com, but in fact the Brazilian equivalent to Othello. A man with a seemingly perfect life turns into a nervous wreck, seeing conspiracies against him everywhere he looks and becoming increasingly psychotic in a manner that threatens to tear his life and those of his loved ones apart. How it unfolds, well, that's not something to be revealed in a book review! Coming back to that bit I highlighted earlier: perspective. This is all from Bentinho's perspective. As the tale unfolds, we see hints of contradictions in his narrative. This is all heavily skewed to reflect his point of view on the events of his life and is coloured by his own biases and psychoses. In all likelihood the narratives of Capitú and Escobar would be tremendously different from other perspectives. As it is, Bentinho is a man dealing with severe issues, and these issues colour the way he lives his life and the problems that emerge. This is where Machado de Assis does well not to limit the novel to showing the tale from his perspective. As a setting, the time and place are well mapped out. 19th century Brazil was a fascinating place, with many cities and society itself modelled on Europe and colonial life. This is captured in Dom Casmurro, a keen look at Brazilian society of the time. Geography isn't the key aspect here, it's the socio-cultural setting. The novel, as mentioned, as finely crafted and written. Machado de Assis' varied style lends itself to the simple romance as well as the subsequent intrigue, and his stylised prose is a delight to read. The inspirations such as Othello and other classic works are fairly notable, but at the same time the novel retains its own distinct style and story. This remains the quintessential Brazilian novel, and is definitely a must read.